Happy Election Day to all of our friends and loved ones! We hope that wherever your political sentiments might lie, you’re taking time today to get out and rock the vote. October marked an exciting time for us here at Destination, as we participated in the inaugural Pumpkin Palooza on the 500 block of Penn Street, brought to us by the good people at the Reading Downtown Improvement District, on October 22nd. The festival included live music and entertainment, a pumpkin pie eating contest, scarecrow making, pumpkin carving, mummy wrapping, a pumpkin seed spitting contest, horse-drawn wagon rides, and of course, the annual DID scarecrow contest! The contest encourages entrants to create humorous, entertaining, mischievous, or lovable scarecrows as a way to bring together local businesses, organizations, families, churches, and schools in a delightful autumn event downtown. We’re very proud to announce the Destination Realty scarecrow, in the form of Despicable Me’s Gru, along with a host of Minions, took second place in the contest! The Penn Street Market included special seasonal goods and produce from the vendors to accompany the Pumpkin Palooza’s events, and if you were in attendance, you might have noticed Destination Realty sponsoring the craft zone for families with two of our lovely volunteers. Donations for the craft zone were generously provided by Weaver Orchards, Home Depot, Opportunity House, and the Reading Eagle. With hundreds of local residents turning out to enjoy the music and carriage rides, the Pumpkin Palooza was definitely an amazing event, and we’re so honored to have been part of it! We’ll be looking forward to seeing you at the next one! A Very Reading Christmas, right down to the tree! This month, some very special preparations for the holidays in Reading are in full swing, with the usual parades and the annual tree-lighting ceremony on the agenda, but also a unique nod to last year’s “Charlie Brown Christmas tree”, which was featured on news stories worldwide. The annual holiday parade will take place next Saturday, November 21st at 9:00 am. It will begin at the intersection of Penn Street and 11th St, and proceed down Penn until 2nd St. In the event of rain, the parade will be postponed until the 28th of November at the same time and location. This year’s tree, a 25-foot concolor fir, is already standing tall and proud in Penn Square. Its official lighting ceremony will be held the night before the parade, Friday November 20th, at 6:30 PM. The tree itself was donated by two Berks County residents, Barb and Pat Emmett, the owners of Godfrey’s Welcome to Dogdom in Brecknock Township, and is considered by many to be a significant improvement over its predecessor. Whatever happened to that ugly tree, anyway? The fate of the tree, which sparked a nationwide debate over whether it was too ugly to display or the perfect way to remind us of the true meaning of Christmas, was influenced by Luke Schultz, a foreman in the city public works department, and Steve Weber, a carpentry instructor at the Reading-Muhlenberg Career and Technology Center. Both felt that last year’s tree did a great deal to bring positive publicity to Reading, and Schultz, a former student of Weber’s, thought that his teacher could help commemorate the tree in a very special way. So, with the help of the students in the carpentry program, Weber fashioned the wood from the “ugly tree” into a commemorative bench that will be featured in this year’s holiday display. The city itself has given a nod to the 2014 viral news event by putting up a doghouse, constructed by the Public Works Department, resembling Snoopy’s own residence, as part of its holiday display. The doghouse was placed at the corner of Fifth and Penn streets, representing the Charlie Brown story of which last year’s tree became symbolic. This Saturday, don’t miss your chance to witness the incredible Reading 120 Cycling Competition! Planning a trip to Reading for the weekend, or just looking for something to do in the Berks County area? You absolutely cannot miss the Reading 120, a grueling 120-mile cycling competition playing out across the Reading area on Saturday. Those of you who have been following us for some time will remember we briefly touched on this event earlier this year, when we discussed Pretzel City Productions and their efforts to bring business and tourism to the City of Reading. Poised to become the greatest single-day road race—or Classic—in all of North, South, and Central America, the Reading 120 will host racers from across the world, including Mexico, Guatemala, Finland, Sweden, Holland, France, Canada, the Dominican Republic, Colombia, and our own United States. Starting out with a tour of 75 miles of beautiful Berks County farmland, and culminating in laps around Reading that include five climbs up Mount Penn, this race holds the distinct honor of being one of only seven International Cycling Union, or UCI, races in the entire USA. UCI races must all be sanctioned out of Switzerland, and to hold UCI status signifies the very highest standard of race quality, attracting competitors from around the world. Spectator info regarding the race’s route, the best vantage points, parking, and event times can be found on the official website here. Along with the race itself, there will also be a salsa dancing event by the finish line, children’s races and other programs for the little ones, handcycle races, and plenty of delicious food and drinks. A full list of events can also be found on the Reading 120 site here. Whether you’re excited to watch the race to beat all races, or you just want to dance at the finish line, Reading is the place to be on Saturday! If you’re not already familiar with Reading Eagle’s new venture, Pretzel City Productions, they’re the folks that brought us the amazing Fire + Ice Festival in January of this year. This month, inspired by the Berks Jazz Fest, one of the city’s most popular annual events for the past 25 years, Pretzel City Productions brings a new type of music festival to the city: the Berks Country Fest. Pretzel City Productions was the brainchild of executive director of circulation and promotions for the Reading Eagle Company and president of WEEU 830 AM, Dave Kline. Kline believes that the City of Reading could experience its own renaissance, fueled by events like this month’s Country Fest, January’s Fire + Ice Festival, and the Reading 120, a 120-mile cycling event sanctioned by the Union Cycliste Internationale, the Switzerland-based governing body of sports cycling, which takes place on September 21st. The Berks Country Fest runs from June 15th-21st, providing you the perfect opportunity for Father’s Day plans, and celebrates the diverse musical genres that embody the melting pot of America, including country, acoustic rock, Americana, folk, bluegrass, jazz, world and orchestral music. Major headliners include Ruthie Foster, Mary Fahl, Bill Staines, and Mexican guitar duo Rodrigo y Gabriela, as well as a variety of local bands and musicians. There are loads of great events going on for the duration, and it all starts with a kickoff on June 15th at 3PM, at local favorite restaurant, The Peanut Bar. In addition to these special performances taking place throughout the festival, there will be two free concerts featured as well. The Common Chords Concert for Unity & Peace will be taking place on Saturday, June 20th, along Reading’s Restaurant Row; and the Reading Pops Orchestra with special guest Dave Cullen will perform Music of America, their annual Father’s Day concert, at Cacoosing Meadows Park in Sinking Spring (bring your own lawn chair!). The full schedule of events, as well as tickets to purchase, are available from the official Berks Country Fest website: http://www.berkscountryfest.com. We hope to see you there! As some of you might already know, last month marked four years since the founding of Destination Realty, LLC. When we started out in 2011, the only employees were Sean Moretti, the founding realtor & broker, and one part-time administrative staffer to handle real estate sales and commercial leasing. We started with one client, a property owner who had a few rental properties in the city of Reading to be managed for rent collection and city codes inspections. Since then, Destination Realty has grown to a staff of five employees covering the marketing, accounting, leasing, and administrative departments. Furthermore, we now proudly provide property management services to over 20 owners and almost 100 rental units in Reading, West Reading, Birdsboro, Mohnton, and other municipalities throughout Berks County. While we’ve invested in some advertising along the way, we owe the majority of our growth to word-of-mouth and referrals from past & present clients as well as fellow realtors. We’re proud of our relationships with both the property owners whose units we manage, and the prospective owners & renters that come to us to help them find a place they can be happy to call their home. Those relationships have brought us to where we are today, and we are so grateful to continue to grow and develop with all of you in the coming years. Thank you for choosing Destination Realty, LLC, and we can’t wait to see what the future holds! 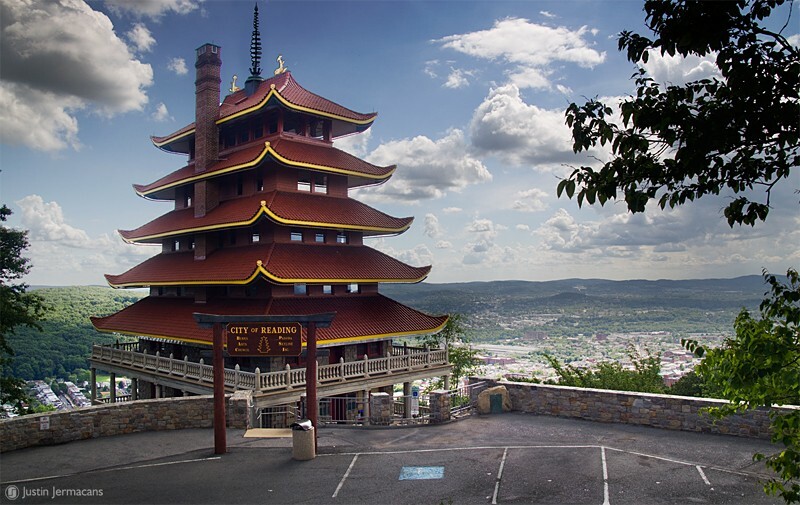 One of Reading’s most iconic landmarks, the Pagoda can be seen for miles beyond the city limits, regardless of season, a mountaintop sentinel of sorts, keeping watch over the city. It’s even been featured in at least one major motion picture! However, despite its prominence, many people are unfamiliar with its history, or are unaware of the myriad of activities and events that are currently offered there. Whether you’ve never seen it up close, or you’ve visited plenty of times, there’s lots to do at the top of the city! Originally intending for it to serve as a luxury resort atop Mt. Penn, and more importantly, cover up the damage his quarrying operation had done to the mountainside, William Witman, Sr. commissioned the Pagoda in 1906 for $50,000. The Pagoda was designed in the fashion of a battle castle hearkening back to the Shogun Dynasty in Japan, complete with an antique bell, cast in Obata, Japan, in 1739. Construction was completed in 1908; however, because of an unfortunate series of events involving bank foreclosure and Mr. Witman being denied a liquor license, he never actually opened it. In 1910, the Pagoda and its 10 acres of surrounding land were deeded to Jonathon Mould, a local business owner, and his wife, Julia, who proceeded to sell the property to the City of Reading for the grand sum of $1. Since then, it has undergone repairs and restoration twice, once in the late 60s, due to fire and weather damage, and again for its hundredth anniversary in 2008-2009. 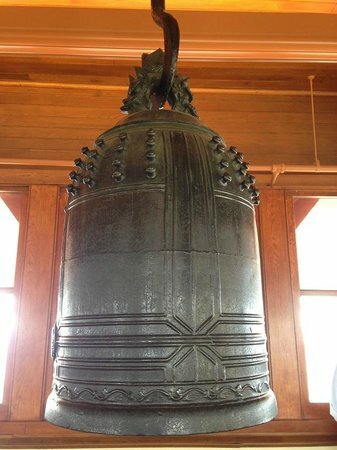 Currently, the Pagoda is open from 12-4pm on Saturdays and Sundays. The Pagoda Café on the first floor offers free WiFi, along with snacks, hot & cold drinks, locally brewed sodas, Berks Hot Dogs, and other treats. The second floor offers a 20’x30′ room that can accommodate up to 50 people, which is available to rent for meetings, small weddings, or parties. The top floor, of course, features the observation deck, and the famed Japanese bell. On the first Saturday of every month, the Pagoda Writers meet in the café from 1-3pm, and just last week, the city held Groundhog Day at the Pagoda. Twice a year, in June and August, the Blue Mountain chapter of the Sports Car Clubs of America hosts the Pagoda and Duryea Hillclimb Races. There’s also plenty of volunteer opportunities, if you’re looking to give a little something back! For a full schedule of upcoming activities and information on rental rates, tours, and volunteer opportunities, visit the Pagoda website at www.readingpagoda.com. All images (except antique bell) property of photographer Justin Jermacans, who has an entire series of gorgeous Pagoda pictures worth checking out. Stay frosty at the hottest event this season: the Reading Fire + Ice Fest! Free up your schedules for this weekend, because the Reading Fire + Ice Fest is the place to be! The event, brought to you courtesy of the Downtown Improvement District, runs from Friday, January 16th, to Sunday, January 18th, and offers a wide array of indoor and outdoor activities that everyone can enjoy. Not only will there be a 5-alarm chili cookoff and a Snowfall Ball at the historic Abraham Lincoln Hotel, but the streets will be filled with live music, salsa dancing, interactive ice sculptures, an ice bar, as well as an ice-carving competition. 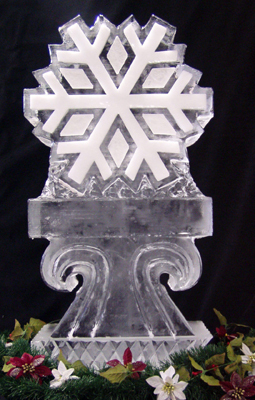 Sculpted Ice Works creates wedding ice sculptures, seafood displays, color logos in ice, ice luges, ice bars, live ice carving demonstrations for any event, team building courses, custom designs for photo shoots, fashion show backdrops, hanging sculptures and more. The full schedule of events can be found online at http://www.readingfireandicefest.com/events.html. Sponsors of the Fire + Ice Fest, including Destination Realty, will also have their logos (or iconic symbols from their logos) carved in ice and displayed during the event, so keep an eye out for us while you’re enjoying all the festivities! We look forward to seeing everyone there!